Oh how I love to take a bath. I love to light my candles, pour myself a glass of wine, and read an interior decor magazine. However, it's often also met with pounding on the door from a 4 year old who is yelling "Let me in!! I want to take a bath with you!!!" Usually it's more rewarding in my head, but I still love my baths. They don't happen as often as I wish but I so appreciate them when I do get to indulge. A tub, is a tub, is a tub. They all serve the same function. But what if you could have a metal tub? I'm talking a show stopper, scene stealer. It obviously will take center stage, as it should, because the price tag is hefty, but will send your retreat to a whole other level. 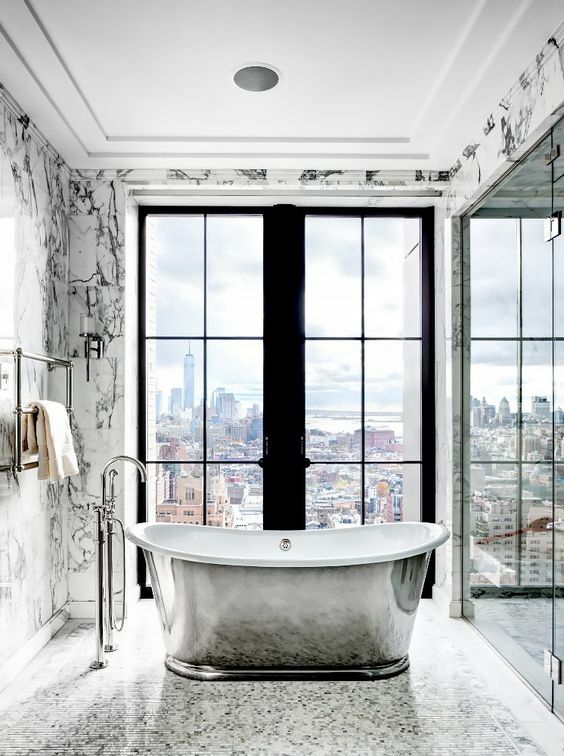 Again, this would be best for your master bath, because well, can you imagine all the hand prints that would be on it if it was in a child's bath? Oh, and all the water marks from the typhoons that normally happen in my kid's bathtub. This, this is a special bathroom full of high end finishes and decor. MOODY WAINSCOTTING WITH A GRAPHIC FLOOR AND A POP OF COPPER. Oh my goodness. You've got art deco mixed with this "rustic" copper tub for a special little retreat. WHAT A GREAT SHAPE AND FINISH. This is a great mix of different textures and finishes. another moody bathroom is giving me all the feels. Between the matte square wainscoting, mirrors, and tub. oooooooh that shape looks so relaxing! A monochromatic bathroom with the tub pulling the colors of the rug out. There's a lot of shiny going on in this bathroom, but because it's all simple, it works. I would live at walker tower too since it's outfitted top to bottom in waterworks. I have this thing for venetian mirrors. I NEED TO START SHOPPING FOR A DRINK TABLE TO ACCOMPANY MY TUB. a calm, spa like bathroom. The exterior of this house is special i'm sure of it. with arched windows and unique angles I'm sure this isn't the only special room of this house. I AM IN LOVE WITH THIS TRADITIONAL BATHROOM WITH THE SHEER SHADES, LIGHT FIXTURE, AND BASKETWEAVE TILE. AND OF COURSE THE TUB WITH BOOK HOLDER. Any guesses where I'll be tonight? I've got a hot date.